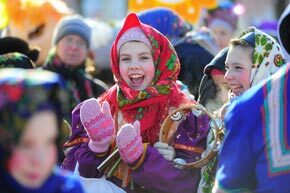 Russians celebrate traditional Slavic festival of Maslenitsa, which welcomes Spring, in the Russian city of Yaroslavl on March 11, 2013. Russians celebrate traditional Slavic festival of Maslenitsa, which welcomes Spring, in the Russian city of Yaroslavl on March 11, 2013. Source: ITAR-TASS/Vladimir Smirnov.